The ESB-MACC is proud to produce annual signature events such as Viva México, Día de los Muertos, La Mujer, and Awards of Excellence. We host events focused on Education, as well as a variety of event collaborations which can be viewed below. Calling all Austin Musicians! How will the City of Austin make use of $12 Million for Austin venues that are used for the arts, theater, and music? The City of Austin's Economic Development Department and Entertainment Division wants your input. Attend a meeting of musicians to help the City of Austin help you. Hear from City of Austin staff and give them your thoughts on what is needed at Austin venues for Austin musicians and for the Austin community. City of Austin's Economic Development Department and Entertainment Division Staff will be in attendance: Frank Rodriguez, EQ Austin. Gavin Garcia, EQ Austin/ Austin Music Commission Chair. Contact Person: Robert Rivera Ojeda. Coordinated by the Bronze Community Band Project. Join us on the last Tuesday of each month for a special screening from the Golden Era of Mexico’s cinema. Doors Open at 9:15am, film screens at 9:30am. Seniors will enjoy a healthy lunch provided by AARP immediately following the film. Please call to RSVP, as space is limited! 512-974-3789. For special screenings and additional information contact: linda.crockett@austintexas.gov. Angelitos Negros with Pedro Infante will be screened on Tuesday, April 30th. Film Synopsis: Ana Luisa is a beautiful blonde. Jose Carlos, a famous singer. Both consider themselves caucasian, but the product of their love is a beautiful black little girl. Ana blames her husband and rejects the love of her daughter, who suffers racial injustice. The housekeeper hides the life-changing secret. Featuring famous Mexican actor Pedro Infante. Roots & Rhythms Presents: Candela! Come join Roots & Rhythms Cultural Arts Program at the Emma S. Barrientos Mexican American Cultural Center, for our third annual, free, family interactive!! This year we’ll be joined by three time Austin Music Award winners, Hardproof Afrobeat, along with acclaimed Latin band, El Tule, playing a mix of cumbia, salsa, and reggaeton. We’ll be moving, shaking, laughing and shouting, at this family friendly interactive for the whole family…seats are first come, first served, so get there early! Daniel Llanes will perform ChicAztlan Jazz / World Beat music on the plaza at the ESB-MACC. Come enjoy good tunes and good vibes in the afternoon sun! This free event is part of an ongoing music series at the ESB-MACC. The music is free, outside, and appropriate for all ages. Dancing is encouraged! Superfónicos and KUTX invite you to a night of Cumbia and community at the MACC, to celebrate the release of the new single "Cumbéalo". Celebrate the release of Superfónicos new single, "Cumbéalo" with a special musical celebration highlighting the roots of Cumbia from Africa to Texas . Special guest musicians from Africa, Colombia, Mexico and Texas will be joining the band through out the evening.7" vinyl copies of the new single will be available for purchase as well as T shirts and CD's of the band's EP "Suelta". On Sunday, May 12 at 3pm, the Emma S. Barrientos Mexican American Cultural Center will present Canciones para Mi Madre, (Songs for my Mother) a music concert performed by Trio Los Vigilantes with special guest Julie Slim. Celebrate Mother’s Day by bringing together music and culture to honor our loved ones; our mothers, grandmothers, and all the special Mom’s that are in our lives.Trio Los Vigilantes have been delighting audiences for over a decade and continue to create magic with classic bolero songs from yester-year. This event is free and open to the public. Parking is free. Doors open at 2:30pm! Established in 2009 by the MACC Advisory Board, this award recognizes remarkable Latinx for the highest artistic excellence they bring to the cultural arts of Austin, TX. Individuals or groups from any artistic discipline who have demonstrated distinguished service, leadership, dedication, outstanding performance and a lasting contribution to the arts can be considered for this honor. Join us for this event to celebrate the Awardees! The ceremony will begin at 7:00pm. To see past awardees, please click here. A celebration of women inspired by the first feminist of the New World, Sor Juana Inés de la Cruz, with food, art, and performances by women. The day of Mexico's Independence from Spain is always remembered on the 16th of September. Our father of independence is Miguel Hidalgo y Costilla, who started the revolt on the eve of the 15th of September. A day to remember our loved ones who have passed with offerings, music, food, and kids activities. Part of Mexican culture is learning from our ancestors and learning where they came from to guide our future. 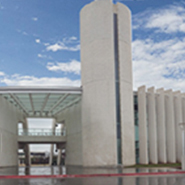 The Emma S. Barrientos Mexican American Cultural Center is a vibrant arts center with 100,000 annual visitors. Since 2007, we have been offering countless cultural events and art classes focusing on performing arts, music, literature, film screenings, and the Latino Arts Residency Program. A collaboration is a one-time presentation that is co-produced with the ESB-MACC. It can be a panel discussion, music or theater presentation, film screenings or community engagement discussion. The ESB-MACC organizes year-round activities and also cooperates with a large number of partners who complete and strengthen programming through rentals and collaborations. For more information, download our collaboration request form. All of our events and programming are free and open to the public! The ESB-MACC is located at 600 River Street in Austin, Texas along Lady Bird Lake. Free parking is available to those attending our programs, galleries and special events. 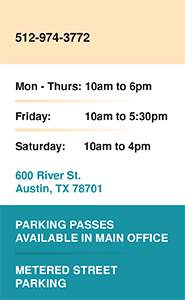 A temporary parking pass is available in the main office.